Looking for a disabled-friendly or accessible home on PrimeLocation? Here’s how to do it. Looking for a disabled-friendly home that will give you independence and freedom? A property with full wheelchair access, for example, a bathroom that has been adapted for accessibility, or a dedicated parking space nearby? Fortunately, there is an increasing range of adapted property on the market. But because the term 'disabled' is open to many different interpretations, it can be tricky to identify specific requirements. 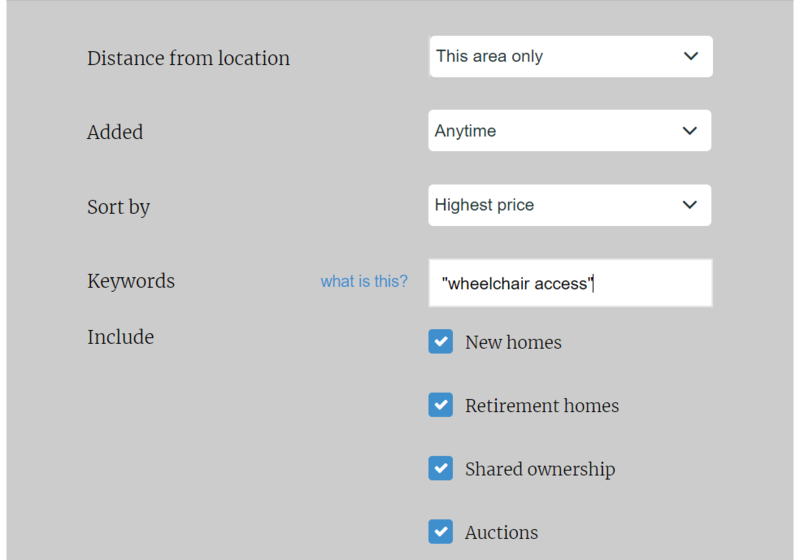 PrimeLocation’s keyword search function can help pinpoint your ideal disabled-friendly home to rent or buy. From older properties that have been adapted, to modern homes built to specific requirements, they are just a click away. Here’s how to do it. When you've landed on the property for sale or property for rent pages, click on 'Advanced search options' and punch in exactly what you are looking for under the keyword section (as illustrated below). If you don't find immediate success, keep playing around with different keywords. You can also search for exact phrases by using quotation marks e.g. "wheelchair access". You can also access the Keywords and features function after you have initially searched for the location you are looking to buy or rent in. You can see what this version of the tool looks like, below. In addition, it's also advisable to register with local estate agents directly. They will be able to identify other disabled-friendly properties available in your area. You should also get in touch with your local authority, as you may be eligible for social housing that has disabled access, or they may be able to advise you on properties in the area that could meet your requirements.